When Sushinho opened in Chelsea, the idea of Japanese-Brazilian cooking was revolutionary. But London embraced the newcomer, and four years down the line the owners have expanded. The new Sushinho City is in Devonshire Square near Liverpool Street. Expect the same cool design of bare brick walls and acid green leather banquettes and a menu that runs from the lobster California house roll of mango, cucumber, wasabi, rocket and tempura flakes, and Wagyu beef sliders with onion relish and pickled cucumber, to dishes like fried chicken with kimchi, pineapple and cashews. The extensive Latin/Asian cocktail list is reason enough to book here. Lunch Mon.-Fri., Dinner Sat. Sushinho City, 9a Devonshire Square, London EC2, 020-7220 9490. Claude Bosi's Hibiscus is known as one of London's top restaurants, but the chef is now venturing into the realm of gastropubs. With his brother Cedric, he took over the Fox & Grapes in Wimbledon last year, and they've opened The Malt House just off Fulham Broadway. Modern British pub food is on the menu at this spot housed in a pretty, elegantly refurbished eighteenth-century building. Former Hibiscus head chef Marcus McGuinness is at the helm, producing dishes that are halfway between gastropub and top restaurant food. Try warm mussel and ginger broth with winter vegetables for a starter, and mains such as traditional hot pot of mutton and apricot. You can get snacks at the bar, and traditional roasts bring in the punters on Sunday. Breakfast, Lunch & Dinner Mon.-Fri. The Malt House, 17 Vanston Place, London SW6, 020-7084 6888. After experiencing more than a few zany menus and questionable fusion concepts, it's refreshing to witness the opening of a place like Bodo's Schloss. You can't get cosier than at this Austrian ski lodge (yes, there are skis in the entrance as if you've just come in off the slopes, and waiters are dressed in lederhosen). It's so kitschy it veers towards trendy. In fact, it definitely will be, as it's part of a nightclub that's owned by the minds behind Whisky Mist and Mahiki, ultra-fashionable clubs beloved by the younger members of the British royal family. Feast on schnitzels and spätzle, wash it down with a stein of beer (or some good wine), and rock along to the retro music. Tues.-Sat. 6pm-3am, meals served Mon.-Sat. 6.30pm-10.30pm, disco from 10pm. 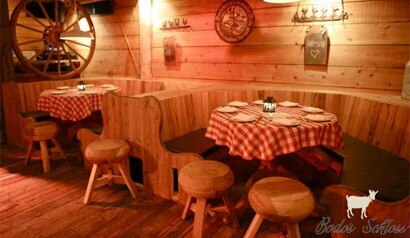 Bodo's Schloss, 2 Kensington High St., London W8, 020-7937 5506. Spanish cooking is alive and well and living in London. And the latest evidence is Hispania, from Marcos Morán of Casa Gerardo in Asturias. At the moment the place is in a soft launch state, with cold tapas served in the ground floor bar. When it's all finally open, there will be a deli, winery, sherry bar, dairy and store. Upstairs there's an events space and a serious restaurant. Mon.-Fri. noon-10pm. Hispania, 72-74 Lombard St., London EC3, 020-7621 0338. Cucina Asellina, which has outposts in Atlanta, Georgia, and New York City, has debuted in the new ME London hotel on The Strand. It's a striking place with concrete floors and deep red walls. The good Italian cooking ranges from panini and pastas to fish dishes. Among the cocktails, try the "Famosa" with Ketel One Citroen, ginger-infused Domaine de Canton liqueur, white cranberry and triple sec. Mon.-Wed. 11am-midnight, Thurs.-Sat. 7am-12.30am, Sun. 11am-11pm. Cucina Asellina, ME Hotel, 336-337 The Strand, London WC2, 020-7395 3445. British-born Keith NcNally's Balthazar debuted as scheduled on February 18 in the former Theatre Museum in Covent Garden. The most anticipated new restaurant of the last two years is already booked up until March. This all-day venue is in the same league as the popular Brasserie Zedel, Café Colbert and Les Deux Salons. New Yorkers will be familiar with the restaurant (McNally started Odeon in 1980 and a string of other venues including Balthazar, which opened in 1997). Part-owned by Richard Caring, whose distinguished list of restaurants includes The Ivy and Le Caprice, Balthazar has just the right bustling brasserie look and feel, is open all day and serves all the staples, from French onion soup to oysters to moules frites and burgers. It also has a boulangerie beside the main restaurant. Note that it is much more expensive than its rivals. Breakfast, Lunch & Dinner daily. Balthazar, 4-6 Russell St., London WC2, 020-3301 1155. The former Notting Hill Brasserie is scheduled to open in March as the Notting Hill Kitchen. Not a huge change of name, but a different slant from Portuguese chef Luis Baena who has worked with Paul Bocuse. Seasonal Portuguese and Spanish food is expected with some real gastronomic treats. The wine list ranges far and the bar will offer small plates and dishes to share. Notting Hill Kitchen, 92 Kensington Park Rd., London W11, no phone. 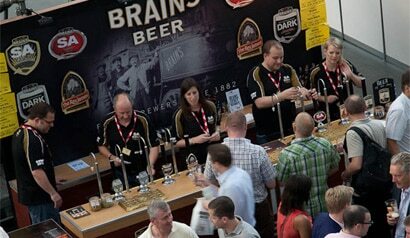 The Great British Beer Festival will return August 13-17, 2013, featuring more than 800 cask and bottled ales, ciders and foreign beers. Olympia London has been set as the venue. Tickets will go on sale in April 2013. For more information, visit gbbf.org.uk. Eric Chavot, who made his name at The Capital Hotel, is taking over the Gallery restaurant at The Westbury Hotel on Conduit Street where he will launch Brasserie Chavot. Along with the main restaurant, a seafood bar will accommodate counter dining. The menu will be French and friendly as in a mini cassoulet for one. Set menus will be around £35 for lunch and £55 for dinner. Brasserie Chavot, 41 Conduit St., London, UK W1A 4UH, no phone. Gordon Ramsay's flagship restaurant, Restaurant Gordon Ramsay, in Chelsea closed for a refurbishment on February 8. Unlike other restaurants that have also gone dark while the designers do their thing (such as L'Oranger, which says it is either closed for a refurb or is about to be sold), Restaurant Gordon Ramsay will reopen --- on March 14. What will they do? Just a lick of paint, or a new kitchen or brand new look? As they say, watch this space for the answer. Restaurant Gordon Ramsay, 68-69 Royal Hospital Rd., London SW3, 020-7352 4441.